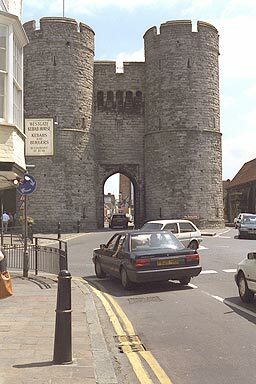 The West Gate of Canterbury was originally part of the City Walls. The current gate replaced an earlier Roman one. The gate was built by Archbishop Sudbury and was finished in 1380. Sudbury met a violent end in the year after the gate was finished. Westgate was used as a prison for many years but has been a museum since 1906. You can enter and climb to the top for some great views of the city. The gate is somehat of a traffic problem, buses and lorries only just fit between the arch. Traffic coming towards you goes round the right of the gate.